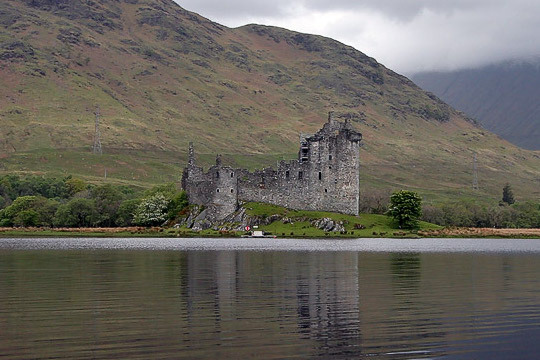 Argyll is Campbell land, Kilchurn Castle, the stronghold of the Campbells of Breadalbane, the second most powerful branch of the Campbell Clan. Their treachory lead to Cromwell destroying the Mcfarlane seat at Inveruglas on the Bonnie, Bonnie Banks. Today I'm going on a raid, into deepest, darkest Argyll. Enemy territory. Within sight of beautiful Loch Awe and the menacing presence of Kilchurn Castle. Beinn A'Chochuil and Beinn Eunaich lie in wait, will this lonely Macfarlane walker succeed or will the Campbell Bens prevail? Well to find out, I parked up the Astra at the tiny, verge side parking space just beyond bridge over the Allt Mhoille. It's not so much as a parking space, but a place where the narrow road is a little bit wider! Booted and ready just before 9:30am, I set off up the long landrover track that leads up the glen between the Cruachans and the Cockles. Soon the first defender of the Campbell raised his big ginger head... but was too lazy to pay me much heed. The track is excellent, thanks to the nearby power station, but it climbs at a steady rate up into the glen, steep in places, but nothing too sinister. Back behind I prayed that no Campbell spys were up early to see me from Kilchurn's turrets. I continued along, no defenders in sight until the Glen Noe Young Team clocked me from a mound on the trackside. But they were seen off, their Mammy shepherding them away from trouble. As I looked up the glen, I saw what the first real Campbell trick would be, CLAG! The first target of the day, Beinn a'chochuil, the only hill around cloaked in the grey gloom. Shortly after the track descended to a new looking bridge, I thought about throwing these Campbell's "a curve ball" to use modern parlance. Could I head straight up the hillside to bealach between the two Campbell Bens? Split their defences and conquer one at a time from the Lairig Lanachain? I thought about, it tempted me and I began to head off up the hillside, but the clag was growing thicker. But it was a Campbell trap!!! The Grey Gloom swooped down from Beinn a'Chochuil, devouring everything in it's path. I was nervous, had it seen me? Had I been betrayed? Retreating back to the safety of the track and my planned route. I wouldn't be getting lost today. It was a wise decision. I'd barely touched the stoney path and as quick as it had appeared the clag retreat back to it's lofty perch atop Beinn a'Chochuil. Trial number one, I had passed. Just. Soon after another track joins the first, coming down off the hillside at an acute angle, nearly doubling back, but gaining height quickly. I followed this new track round the hillside, confident again. I could see down to the point where I had so nearly been ambushed. Better still I could reconnaissance my second target of the day, standing clear and proud across the bealach, Beinn Eunaich. I could also pick out my prepared route of escape down the steep side of the Beinn. Across the glen, the Cruachans looked upon me like gnat, small and insignificant, yet they had already fallen under my boot. I smiled at them, I knew their real character. Beinn a'Bhuiridh, Stob Garbh, Sron na Isean and Stob Diamh watched me pass, Like a true Campbell overlord, Cruachan itself remained cunning out of sight. Letting other, smaller lackies do his work. As I gained height, I began to realise the Campbell's secret weapons, It's steepness and it's length were sapping my energy. I was faultering already. I wouldn't be defeated, that's what lucozade and chocolate are for! Energy boosted, I gained more height. The first pathless section of hillside, lead to a rudimentary path, which became stronger as I climbed the hill, an unexpected ally to help guide my way. Eventually I began to near the top of the ridge, the second Campbell secret weapon was unleashed, the wind! Gale force and blowing a hoolie, it nearly knocked me clean off my feet. I was nearing a rocky knoll, it would provide shelter. Here I met two fellow walkers, unaware of my mission, they greeted me merrily and spoke of their great day out in my Clan's homeland, Arrochar and The Cobbler only the day before. Out of the winds brute force they ate a hearty brunch and I readied my defences, out came the Sprayway jacket and my walking pole to brace myself against the wind's cutting edge. From here the ridge become fairly narrow, the northern side adorned with corniced snow, hanging precariously above the precipice. I was granted fleeting glimpses of the mountains to the north and of Loch Etive. I walked on, over the more or less flat ridge, until the final very short pull up to Beinn a'Chochuil summit. Target one acquired and conquered. I didn't hang around, the wind was swirlling and the cairn provided next to no protection from it. From here, I had to retrace my steps back to the small cairn, at the point I'd reached the ridge and first been blasted by the wind. I'd copy the only two other walkers I'd seen all day and eat lunch in the protection of the rocky knoll. On the way back, the Lord Of The Manor, Ben Cruachan, acknowledge my achievement so far and shed the cloak of gloom surrounding me and it. For a heartbeat all was clear-ish. Then Cruachan was shrouded in mystery again, it's hollow heart allowing no kindness. After my lunch at the rocky knoll, I once again stepped out into the wind and headed east, Beinn Eunaich in my sights. Walking was becoming difficult, the wind blasting against the northern wall of the ridge and then up, over the top, dragging small bits of snow and ice with it. Even the occaisional bit of gravel was fired ruthlessly in my direction, this was no place to be. I reached the Lairig Lanachain and looked down to either side. Barely able to turn and face north, into the wind. Soon I was below the pull up Beinn Eunaich, a different challenge, steep but not unrelenting, boulder strewn. A'Chochuil is grassy with rocks, Eunaich is rocky with grass... from this approach at least. I began the walk up, apprehensive. The ridge is quite narrow and doglegs. At the bend it narrows again Shortly after the path enters the boulder field and a prominent stone I christened The Guardian points the way to go. The Guardian must be rounded and as you do so, two pillars of rock stand on each side of you. As you pass them you are, suddenly and unexpectedly close to the corrie rim. On a nice day, this would be a pleasant vantage point. Not today. The wind was scaring me witless. Roaring up the side of Coire Odhar and blasting me, making me stagger like a drunk man. I hunkered as low as I could and on all fours scrambled up over the rocks away from the corrie. My heart was in my mouth. The wind was making this supposedly straight forward hill into a nightmare. Eunaich had to be conquered, I would not fail, I was not coming back here for one lousy hill. Bad thoughts, but the route to salvation, out of the wind, lay on the other side of the hill. Using the hill own bulk against it, I would emerge victorious and it was safer option rather than descending back down the ridge to Lairig Lanachain. I stumbled onwards and upwards, now safely away from the corrie edge. I could see the cairn, even as the world below me disappeared into the gloom. I hoped to reach it, it was only yards away, but it may as well have been miles. The wind was getting even stronger, to even stand I was having to use my pole as a brace. To walk over the boulders it was a case of step, brace, steady myself, step, brace, steady.. over and over. What felt like a comically long time later I touched the big pile of rock marking the top of Beinn Eunaich. Target two, acquired and conquered! Thank god there wasn't a target three! I had reached my objectives, the Campbell hills had been taken, turned blue on my map but Eunaich was far from subdued. It's windy ally was going to blast me all the way down it's long arm, an arm I knew gets steeper and steeper the further down you go and now the final weapon was unleashed. Rain, driven on the gales. Was it Campbell tears of defeat? I didn't want to speculate, I had to get down. Another rudimentary path was guiding my escape route, reaching down the long shoulder. It aims more or less for the head of Loch Awe, aiming directly at the get away vehicle, waiting down below. Hope errupted like a flare. Now the wind was MY ally. Pushing me down the grassy path. Skirting round the side of some soft, potentially boggy stuff. Until enough of Eunaich lay between me and the wind's might. The path then cruely twisted, following Eunaich's arm. The bulk of the hill was now only partially shading me. My left side and back drenched in the rain. I knew the steep descent was coming, I was praying that the rain wouldn't make the route down treacherous. Soon I was going over the top, the steepest part of the descent lay directly beneath my feet. I was lucky, the rain eased and as I went down, the hill once again blocked the wind. The path remains grassy at first, a series of steps beat into the hillside by countless hundreds of boots. My Mcfarlane soles and my Mcfarlane soul now depended on getting down safely. But once again those sneaky Campbell hills played one last trick, allowing the path to become and erroded and a stoney chute heading directly down hill, with little in the way of zig-zags to ease the route. As I clambered my way downwards a few of the locals gathered to laugh at the two legged oaf, making his way precariously downhill. Behind them the path afforded good views of the ascent route up Beinn a'Chochuil and up to the Lairig Noe as well of Sron nan Isean and Beinn Bhuiridh. Beinn a'Chochuil had caped itself in clag, hiding from it's conquerer! Finally I got down, back onto the track on which the whole adventure began. Kilchurn Castle now looking like the beautiful ruin it is beside stunning Loch Awe. A strenuous and testing day on the hills, haunted by Breadalbane Campbell ghosts, blown in on the wind, but somehow I still enjoyed it! The Campbells are long gone from this area, after a successful, but costly dispute with the neighbouring Mcgregors of Glenstrae they moved to Kenmore, Perthshire on the other side of their lands. They built the massive and oppulent Taymouth Castle, which is now in the care of the nation, having stood empty since 1979, it's beautiful gardens I recently visited and are well worth a look if you are in Kenmore. My granny was a Macdonald so I was with you on your foray into Campbell territory! Brought back memories of that final steep descent with my pal recovering from broken ankle. I think with hindsight we'd have reversed the route. ScottishLeaf wrote: Soon the first defender of the Campbell raised his big ginger head... but was too lazy to pay me much heed. You were lucky! The Hieland Coo defensive line is usually much better organised than that (i.e. blocking the track!). dogplodder wrote: I think with hindsight we'd have reversed the route. It's a bit of a grim slog in ascent! A more interesting but slightly longer way up Eunaich is to take the Glen Strae track, then the path heading towards the Lairig Dhoireann. Head up to the 880m top, and then along the ridge to the summit. If u r brave enough, we must go walking again soon! My mother-in-law is a Campbell! Thanks for taking time to put together such an entertaining and informative narrative. I’m a McKay so you would near to go a wee bit further north before you stepped on my ancestral toes!